There is perhaps not a single thinker in the world more fearless than Kyrel Zantonavitch. 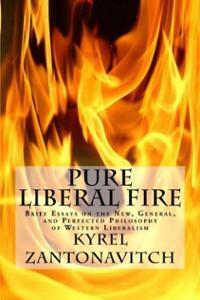 Pure Liberal Fire is the direct, provocative distillation of his thoughts on metaphysics, epistemology, ethics, politics, economics, culture, religion, and the history of philosophy—including Objectivism and Classical Liberalism. Zantonavitch seeks to evoke a pure, true liberalism, and he shows no mercy for ideologies and attitudes that constitute its antithesis. He certainly leaves no doubt in the reader’s mind about where he stands on the issues addressed—and each article within the book employs an abundance of superlative expressions—be they positive or negative. When Zantonavitch praises, he really praises—and the same goes for when he condemns. I give this book a rating of five stars because it invariably makes people think—no matter who they are or what their starting persuasions and assumptions might be. There are many areas in which I strongly agree with Zantonavitch—and quite a few where I strongly disagree as well. He articulates many valid points about the fundamentals of philosophy, the importance of liberty in political theory, atheism, the damage perpetrated by various political movements and policies, and the unfortunate tendencies among historical and current Objectivists toward dogmatism and conformism instead of independent thought and the honest pursuit of truth. Some of our areas of disagreement include war, areas of foreign policy, and, perhaps more generally, the desired mechanisms for achieving societal change. Zantonavitch combines his no-holds-barred treatment of his subject matters with a unique dialectical technique. There are several places in the book where he characterizes a particular set of ideas (or people) in a strongly negative way—but then later (or earlier) also portrays them as either highly praiseworthy, or at the very least understandable and characterized by redeeming attributes. Two examples that come to mind are (1) his discussions of Objectivism as a brainwashing cult in some places and as the most advanced, best-developed philosophy to date in others, and (2) his characterizations in some places of religious believers as not particularly bad as long as they do not take their belief too seriously—and in other places of anyone who believes in a god or teaches his/her children such beliefs as being guilty of evil and/or abuse. The reader can glimpse in this a deliberate juxtaposition of these opposing characterizations in a dialectical fashion—in an attempt to examine both the positive and the negative aspects of the ideas and behaviors Zantonavitch is writing about. (With regard to Objectivism, there is definitely merit in pointing out both the great strengths and the failures, as I have myself done, for instance.) This also creates a second layer of meaning in Zantonavitch’s work, as his uses of positive and negative superlatives with regard to the same subject are seldom immediately close to one another. While the rest of his writing endeavors to be extremely direct (indeed, provocative) with regard to its meaning, he seems to expect his readers to make their own connections in this respect without him deliberately pointing them out. As a result, with regard to Objectivism especially, Zantonavitch’s readers have the opportunity to acquire a more balanced, nuanced view after having been exposed to both his glorious praise and his scathing condemnation of the philosophy.